MOSCOW, September 3. /TASS/. Moscow is ready to continue supplying rocket engines if the United States wishes this, head of Russia’s State Space Corporation Roscosmos Dmitry Rogozin said on Monday. "We expect that talks with the US will continue. We believe and the country’s political leadership supports us that despite sanctions there is the need to keep exports of high-tech products. If our US colleagues again show this wish, these supplies will continue," Rogozin said. Russia depends on rocket engines’ supplies to the US and seeks to continue them, he said. The US also depends on the supplies of Russian rocket engines, Rogozin stressed, noting that US tax payers would have to spend much more on financing the developments similar to those in Russia. 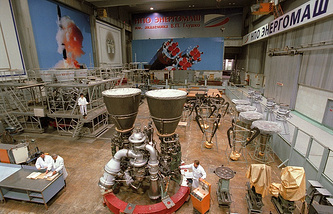 Chief Executive of the engines producer Energomash Igor Arbuzov ealier said that the contract on rocket engines’ supplies was in effect until 2020. Energomash is supplying RD-180 rocket engines to the United States for Atlas III and Atlas V launch vehicles. The first agreement on RD-180 engines was signed in 1997 and provided for delivery of 101 engines worth $ 1bln. The US Congress imposed a ban on RD-180 engines use in 2014 in view of deteriorated relations with Russia but canceled it a year later, when it became clear that the United States will not develop its engines in coming years. The US ordered 18 extra RD-180 engines from Energomash in 2016.